This History of Ireland bracelet is crafted in sterling silver and it is comprised of six 3/8" tall links that along with the lobster claw catch measures 7 1/2" long. 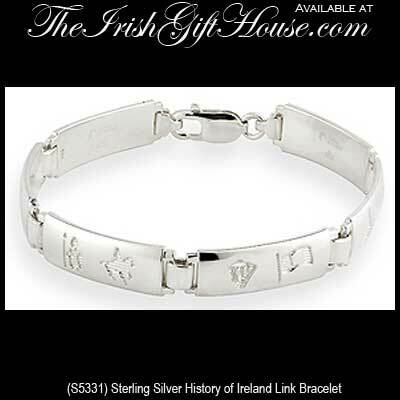 The links are each engraved with two of the twelve icons and this sterling silver History of Ireland bracelet is gift boxed with a legend booklet that explains the symbolism. History of Ireland jewelry is made by Solvar Jewelry in Dublin, Ireland; it is available from The Irish Gift House.